You call that a building? This. This is a freaking building. Presenting ‘Green Spine’. You’re gonna hear that name a lot over the next year or two. 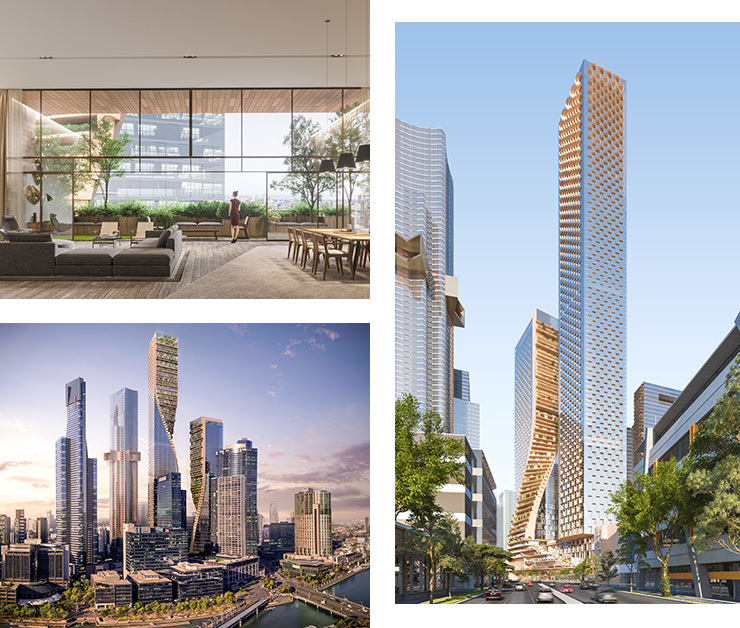 Green Spine is set to become the tallest building in Australia, eclipsing Eureka Tower by about 60m. It’s so tall you’ll be able to hitch a ride on passing satellites. A few more floors and you could pretty much catch an elevator to the Moon. Technically Green Spine will be two towers, twisting around one another in a cantilevered tangle of geometric glass and green garden terraces. So where will this behemoth sit? On Southbank Boulevard, an area that’s positively crying out for high-density housing. But before you grab the scythes and pitchforks, we sat down and chatted to one of the architects behind Green Spine, Pete Sullivan from Cox Architecture (the local firm who won the design competition, hosted by Beulah International) and the news is actually pretty good. Green Spine isn’t just gonna be another Southbank shoebox. Cox Architecture worked in partnership with Dutch firm UNStudio on the design. The whole point was to add utility to the city: to prep for the ‘Melbourne of the future’. Green spaces are going to play a big part of Green Spine (the clue’s in the name). 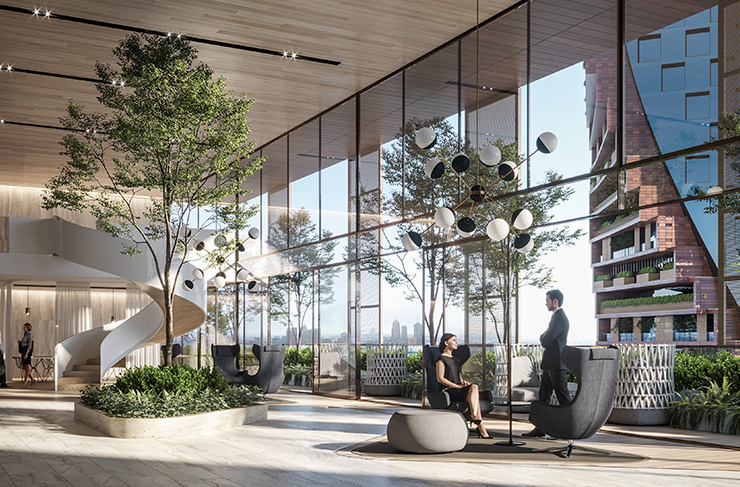 There will be vertical gardens throughout the building, including a sky-high Botanic Gardens on the top floor, with 360-degree views of the city. Pete and the other architects had to work closely with The Eden Project to figure out how the hell this would actually work. Growing plants in the clouds, it turns out, is actually kind of impossible. What about the shadow, Pete? Surely a building that big is going to shroud the Earth in perpetual darkness? Green Spine was the winning design from a six-month search, pulling in A-Grade architecture firms from all over the world. The judges were won over by a few things, including the whole ‘Botanic Gardens in the clouds’ stuff. Mostly it came down to utility: Green Spine will have a vertical school, daycare and library on the lower levels. There’ll be multiple restaurants and bars. And both towers will be dotted with green terraces, gardens, vegetable patches, even trees. If you reckon the Melbourne Skyline is becoming a homogenous, dystopian nightmare, consider Green Spine the remedy. Yeah it’ll be big. Very, very big, in fact. But it could also be kind of beautiful, and useful, and inspiring. At the end of the day, it’s just nice to see a developer who cares about more than cramming the maximum number of international students in the minimum amount of floor space. If this is the future of Melbourne, it’s not shadowy at all. It’s bright. Construction on Green Spine is due to start in 2020. It's expected to finish in 2023.